Is there a better alternative to Amazon MP3 Downloader? Is Amazon MP3 Downloader really the best app in Audio category? Will Amazon MP3 Downloader work good on macOS 10.13.4? 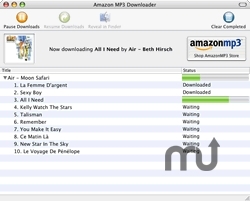 Amazon MP3 Downloader is required for album purchases, and makes downloading songs fast and easy. Amazon recommends installing the Amazon MP3 Downloader before your first purchase. It automatically adds your music downloads to iTunes or Windows Media Player. Click the Download button below and follow the on-screen instructions, or read the detailed installation instructions below. Version 1.0.17: Release notes were unavailable when this listing was updated.